When you start researching your vacation dreams at Disney World you soon come to realize that there is a lot of expense to make your dreams come true. Some things you can't avoid paying and others are a must for certain individuals but there is a few things that you can get a break on that are just as rewarding as something you can over spend on. 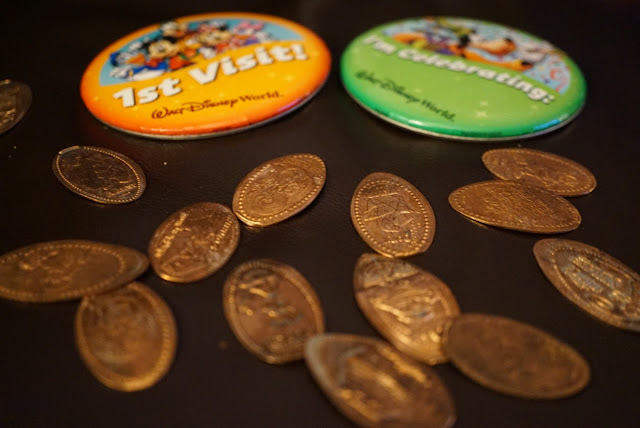 For example there is coin presses with different characters at each resort and all over at many of the attractions in each of the parks. My kids enjoyed picking a picture and pressing the coins. It's a great low cost souvenir to remember your favourite rides. When you get home you can then display the coins in a frame or a book as a keepsake. Father's day is slowly approaching. Boy I can't believe we are in the later half of May already. The cold start to spring and hotter ending has kind of got y senses all confused. None the less, June is just around the corner. Now if you need to do some shopping for good old Dad or your hubby or any other Father figure you feel deserves praise, I have a couple of gift ideas to share with you from Indigo online. You don't even have to get our of your PJ's to get these gifts. Of course there is the obvious gifts you'll find at Indigo in store or online like books and I know my husband can't get enough Stephan King. I know he was a big author when I was growing up but he's still full of imagination and my husband is still enjoy what he's offering. If someone you know likes Stephan King The Outsider could be a great gift. Disney is such a wonderful place to visit. It is very magical and offers you everything to make your vacation amazing. However, a lot of these things can be pretty costly leaving you a not so amazing debt for when you get back. To avoid such stresses, it does help to plan as much as you can. You need to be realistic and if you know whats offered there, you can decide how much that certain things really mean to you and by that I mean when you start to research you may not feel that certain something is worth it or you may find something there that excites you just as much for less. With the onset of May, the warmer weather seems to finally be upon us. In my neck of the woods, we kind of went from Winter to Summer. These days have been warmer then the average early May temps and more reminiscent of a early or even mid June. Nonetheless, for me a little bit of sunshine and above zero temps are enough to get me out there with the BBQ. Today being one of those beautiful days, I thought the family would enjoy some burgers, or mini burgers in this case. I actually opted for the mini burgers because the bun I sourced was a whole wheat type dinner rolls from the bakery section. They looked like the perfect texture for my homemade burgers so I decided to shrink the burgers for the bun. We hadn't been to the zoo in a couple of years. It was a yearly trip but things get so busy with Liam getting older and into sports and to be honest, it's a lot of walking with nothing in between. I'm all for the walk but when you are pulling a wagon with a 50 pound kid in it, plus our snacks and stuff (and sometimes a second kid wants the perk) it can be a bit daunting. However, this year Logan has been studying Penguin's in JK. I'm impressed that he has quite a bit of knowledge on the different Penguins and held on to some facts he learnt in school. He was still longing to see the Chameleon as well so I figured out how to make the trip more manageable on the pocket and how to we can see more without walking an extra 4 miles. Now that the weather is warming up I can finally think about some weekend getaways this summer. I've been thinking about a camping trip here and there in April but with the bad weather it kept leaving my head before I could do anything about it I guess. I thought I'd share a few of the trips we had last year to inspire any of you with the same issue. My In-Laws have bought a great trailer last year and we are very lucky and greatful to have borrowed it a few times. It works out good because they like to go away during week for few days when less busy and we can only go on the weekends. Mother's Day seems to have crept up. I think the snow storm in the later half of April that seemed to linger in the Toronto Area up to the last week of April kind of made it seem that we were still in March at least in my mind. So now that the weather is on the up and up, with today like a summers day, the realization of how close Mother's Day is well shocking. Of course, if you've been reading the blog you'll noticed I wrote about some stuff to do in the area. When you have young kids like I do, I find it more about an activity. However, when it comes to my Mom or my Mother-in-law, I usually opt for a nice family visit and try to pick out a special gift. Flowers are always well received and time with family is key. Even so, it's nice to alternate and show mom that shes special with some unique gifts or use a combination.